After being in business for only 10 months, salon owner Lisa Suárez-Brentzel is struggling — but not in the negative sense of the word. Customers are coming in droves, and Lacquer Gallery is having a hard time keeping up with demand. Lisa Suárez-Brentzel has been doing nails since 2009, but it was in 2011 that she decided to branch out. She tried booth renting for the first time at a salon 30 minutes away from home. 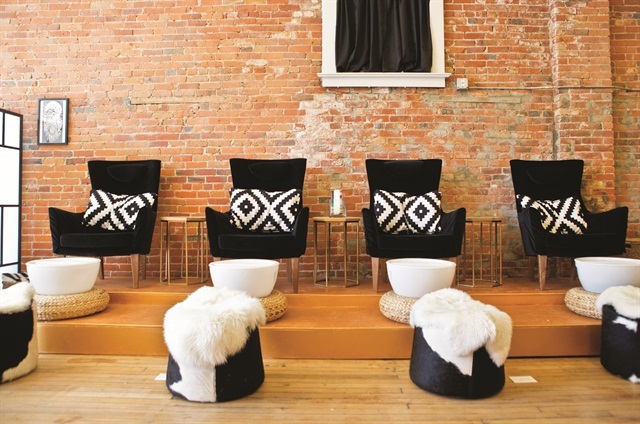 “I was so tired of what everyone thinks of as a traditional nail salon,” she says. Ritzy just wasn’t her style; she longed for a modern, urban vibe — and to be her own boss. Naturally, this led to the creation of her own salon, Lacquer Gallery. 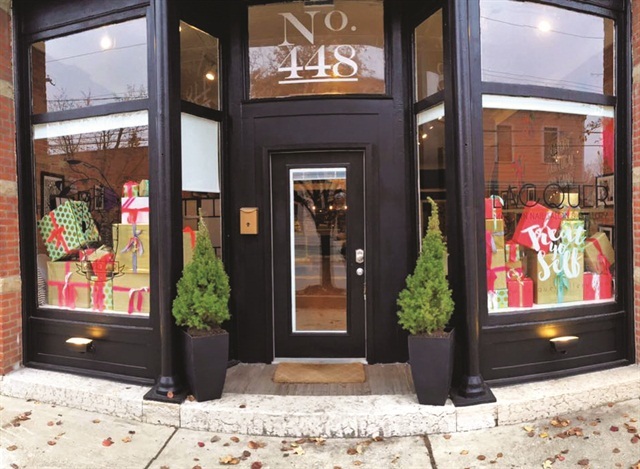 Lacquer Gallery is located in Harrison West, a historic, urban neighborhood northwest of downtown Columbus, Ohio, that is best known for local shopping and some of the city’s finest bars and restaurants. With a demographic of young business professionals, the area is hip and trendy. Suárez-Brentzel was originally looking for a place for her husband to open a tattoo shop, but claimed the property for herself when she saw the all-brick exterior and the vintage metal ceiling inside. She thought it would be a gritty, modern place to start a salon. With encouragement from her husband — and appointments booked three to four weeks in advance at Blake Rose — she knew it was meant to be. Before she knew it, the papers were signed and the salon was ready in two weeks. Eighty percent of the business is focused on nails, and treatments include natural nails, gels, acrylics, and pedicures, gels being the most popular. The salon also offers lash extensions, spray tanning, facial waxing, cosmetic tattooing, and henna. The price for either a manicure or a pedicure starts at $35. Suárez-Brentzel’s philosophy is admirable: “I refuse to charge my clients more than I would pay.” The staff at Lacquer Gallery works very quickly, but are extremely thorough. “I don’t feel like it’s fair to charge too much for something that took me 30 minutes,” says Suárez-Brentzel. Their typical client is the 25- to 40-year-old “girl-on-the-go”; in other words, young and edgy professionals. “If we do have any moms,” Suárez-Brentzel says, “it’s typically the Harrison West, crunchy granola moms who are pulling up in a Subaru after Pilates.” Males make up about 15% of the salon’s clients, and they usually come in for pedicures, brow waxes, and spray tanning. Whether it’s watching “Mean Girls” on Netflix or just hanging out and talking, their clients aren’t just clients — they’re friends. In fact, she’s had clients who came to her wedding. “If someone doesn’t come in for a couple of weeks, we’re like, ‘Oh my gosh what happened to so-and-so? Give her a text and see if she’s OK!,’” she jokes. The goal is to become close and do things together instead of just being the client’s nail tech. Suárez-Brentzel describes her staff as heavily tattooed girls who are really into celebrity gossip. The professional atmosphere is one of support and constant encouragement. When she left for her honeymoon last October, it was unexpectedly busy. Her staff handled it perfectly, and she rewarded them all with Starbucks gift cards. “I try not to treat them like they work for me,” she says. Instead, she opts for simply being the leader of their self-proclaimed girl gang. They aren’t employees — they are family. 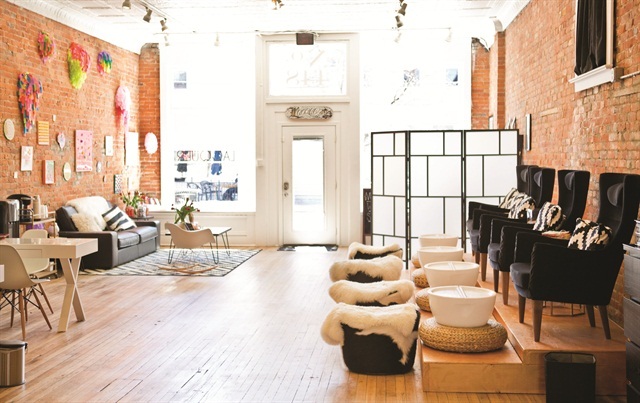 Lacquer Gallery is the epitome of unique, modern style. Suárez-Brentzel’s goal was to make the salon, “…like your girlfriend’s apartment — a cool, lofty space where you can come in and hang out after work.” Filled with works from local artists, including some of her husband’s tattoo art, the color theme is white, black, and gold. 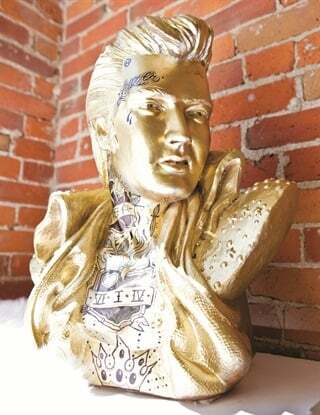 The pedicure chairs are all black velvet, which she describes as “a mix of apartment and IKEA.” Obsessed with Elvis, the salon’s “mascot” is a gold Elvis head covered in tattoos. Business is booming, and networking is a large reason. Local artists have inquired about displaying their pieces in the salon, and Suárez-Brentzel has collaborated with different designers who come to town. “The fun part is collaborating with people in the city instead of it being a competition,” she says. Both she and her employees attend tradeshows when they come to town. In addition, they often learn new skills from YouTube videos, blogs, and one another. Instagram in particular is a huge asset when it comes to staying on the pulse of what’s new and in demand in the world of nail art. “Social media has pretty much made the business,” she says. Pop-up deals — like free nail art with any gel manicure — are also something she enjoys offering periodically. With a list of about 3,200 clients, the only thing left to do is expand. “I’m looking into doing more of my cosmetic tattooing and maybe opening a small private studio for just me and my husband,” she says. Seeing as how Lacquer Gallery has not even been open for a year, it’s safe to say it’s here to stay.